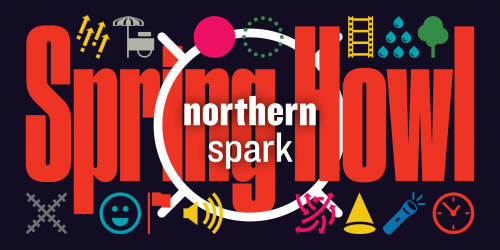 As we move from the season of dark, deep winter to the brighter days of spring, join us for a newly conceived “launch party” and Spring Howl for Northern Spark, an evening filled with indoor art installations, a silent auction, Fulton beer and eats to support one of your favorite summertime events. We’re excited to announce that Spring Howl has a mobile hot spot! A sauna, of course. Little Box Sauna will be stoked on March 20th right outside of the Holden Room. Enjoy a sauna during Spring Howl by reserving a 30 minute space to share with others on the bench. Kashimana Ahua and Filsan Ibrahim, Applause Posse. One of Northern Spark 2018’s most crowd-pleasing performances returns! Let Kashimana and Filsan sing praises for you, a loved one or a total stranger. At least one Applause Posse recipient will be selected through our silent auction. Piotr Szyhalski, Living Banners. In the deep winter of 2017, Piotr “wrapped” 8 blocks of Nicollet Mall with his hand-printed banners, featuring words such as “cold, breath, city, hope” that left passersby to construct personal narratives as they walked down the street. Piotr has presented projects at Northern Spark in 2011, 2013, 2014, 2017 and is a Co-Director of Art(ists) on the Verge. Bring your friends and purchase your tickets here!